(Recto) lower right, signed in pencil: "Man Ray"
Inscription: "Paris" ro. print in pencil; inscr. vo. print erased, wet stamp crossed out in pencil. 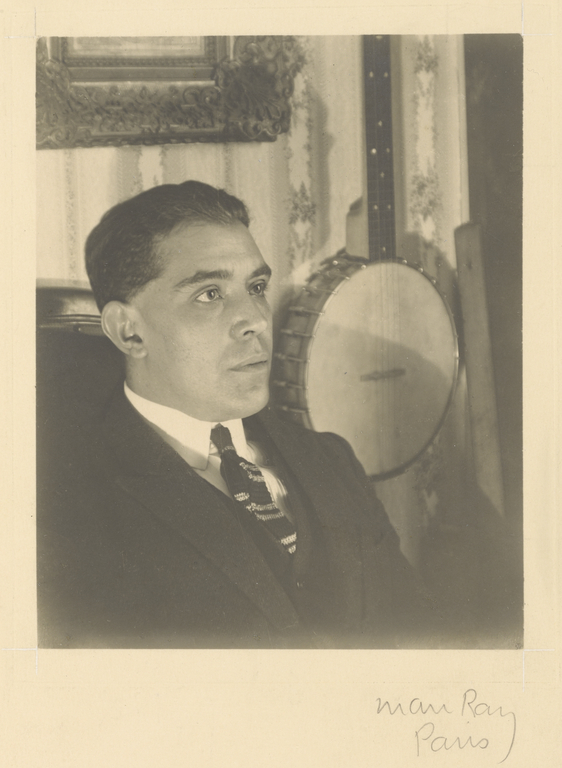 "In the early days Gertrude Stein brought [artist] Juan Gris to my studio. He came prepared to be photographed with a high white stiff collar, as if for a family portrait," recalled Man Ray of the circumstance that led to this portrait. Indeed, Gris's stiff and formal pose implies that he was completely ill at ease with the prospect of having his likeness made. Rosenthal, Mark, ed. Juan Gris (New York: Abbeville Press, 1983), p. 148.